Written by composer, Thomas Tallis, probably in 1570, Spem in Alium is an exceptional 40 Part motet for eight 5 part choirs, that is rarely performed owing to its complexity. On 17 June 2017, a choir of 117 local voices performed the piece in the church of St Mary & St Giles in Stony Stratford. 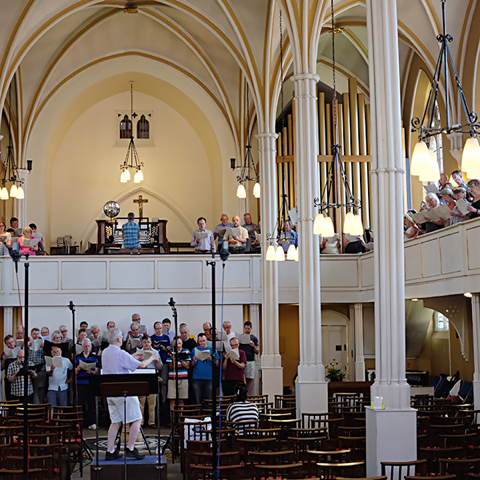 The choir was conducted by Bill Strang, director of The Open University Choir and comprised singers from four choirs from Milton Keynes and the surrounding areas – The Open University Choir, Polymnia, Quorum and Linslade Singers. The organist was Paul Daggett. This is an extract from a binaural recording made by Caroline Devine at the dress rehearsal on 17th June 2017.